Want to escape the commercialization and commotion of the tourist trail in Rajasthan for a while? 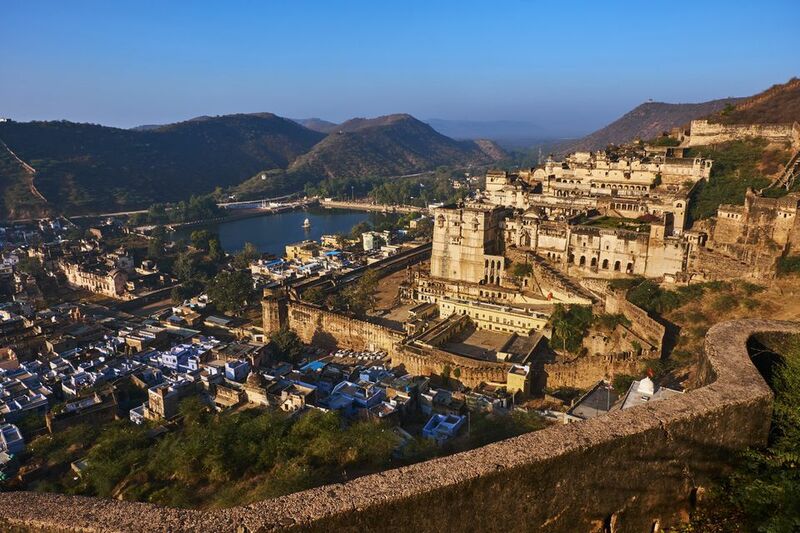 The peaceful town of Bundi, in the Hadoti region of Rajasthan, is usually overlooked by visitors in favor of the state's more iconic destinations. However, the town can easily be reached in about three hours from Jaipur via National Highway 52 and is an ideal stopover if traveling to Udaipur. Like most places in Rajasthan, Bundi has regal heritage. Notably, it captivated and inspired Nobel Prize laureates Rabindranath Tagore and Sir Rudyard Kipling (author of "The Jungle Book"), and Oscar-winning filmmaker Satyajit Ray. There are enough things to do in Bundi to keep you occupied for a couple of days at least. Here's our pick of them. The Hada Chauhans, who ruled Bundi and the region around it, favored the arts. As such King Rao Chhatrasal (or Rao Chattar Sal) established the Hadoti School of Painting, one of four schools of royal painting during the 17th to 19th centuries. This school, created from the Mewar School of Painting in Udaipur, made Bundi known for its own style of Rajasthani miniature paintings. The paintings feature rich colors, and predominantly depict scenes from royal celebrations and daily life. They also incorporate Mughal elements, influenced by Rao Chhatrasal Hada's important position in the court of Emperor Shah Jahan. Many of the paintings can be seen gracing the walls of Bundi's 17th century Garh Palace, and 18th century Chitrashala building (the Hadoti School of Painting's gallery) that's part of the adjacent Ummed Palace. The ensemble of structures in this rambling palace complex were built by various rulers but unfortunately, most are in a neglected state, due to ongoing litigation among the royal family who still owns the palace but have left it unoccupied. Highlights include the grand Hathi Pol gate, Badal Mahal, Phool Mahal, Chhatra Mahal, and Ratan Mahal's Diwan-e-Aam (hall of public audiences) with its marble throne. The complex is open daily from around 8 a.m. to 6 p.m., although times may change according the season. Tickets cost 500 rupees for foreigners, and includes entry to Taragarh fort and camera fee. Indians pay 80 rupees for the palace, 100 rupees for the fort, and 50 rupees for cameras. Hiring a guide is recommended. Otherwise, you may miss significant bits. If you're feeling energetic, follow the steep trail 20 minutes uphill from the palace complex to the sprawling remains of Bundi's ancient Taragarh (Star Fort), which was constructed by King Rao Bar Singh in the 14th century. The fort's condition is also disappointingly dilapidated. Inside, it's overrun by monkeys (do carry a stick to scare them off) and overgrown with vegetation. However, the panoramic view across town from the fort ramparts, which encircle entire hilltop, makes the strenuous hike worthwhile. The fort is an enjoyable place to step back in time and spend a few hours. As you explore it, you'll come across numerous ruins and a serene Shiva temple. Do wear comfortable hiking shoes and bring water to drink. Bundi is also renowned for its multitude of baoris (step wells), which were used for water harvesting and as social meeting places. About 50 of them are scattered across the town, including some that supplied water to the fort. The most spectacular one is Raniji ki Baori (Queen's Step Well). It gets its name from queen Rani Nathawati, the younger wife of ruler Rao Raja Anirudh Singh, who built it in the 17th century. The step well extends down three levels, and its stone pillars are accentuated with magnificent carvings such as elephants and the incarnations of Lord Vishnu. Unfortunately, it's not possible to go all the way inside. Raniji ki Baori is centrally located opposite the police station and Indira Market, just outside the old city's main Chogan Gate entrance. It's open daily from 9:30 a.m. to 5 p.m. Tickets cost 200 rupees for foreigners and 50 rupees for Indians. Bundi's other standout step well, Dhabhai Kund, lies to the south of Raniji ki Baori and is free to enter. The geometric pattern of its steps is an interesting sight to see. Head a block north of Raniji ki Baori, through the market, to find two more twin step wells known as Nagar Sagar Kund. Tickets aren't required to see them. Jodhpur is known as Rajasthan's "Blue City" and Bundi could be considered a mini blue city. Many of its buildings are painted blue as well, to signify the homes of Brahmins. They fan out beneath the palace and line the narrow lanes of the old part of town, which brims with heritage and has delightfully retained the atmosphere of the bygone era. Stroll all the way from the palace to Chogan Gate, at the entrance to the old city, and you'll come across captivating markets and temples as you go along. Don't miss colorful Charbhuja temple, dedicated to Lord Krishna, near Tilak Chowk on the Sadar Bazaar thoroughfare east of Nawal Sagar lake. Many heritage properties in Bundi have been converted into hotels. Staying in one is recommended to fully experience the town's enchantment, and there are plenty of options to suit all budgets. If you can afford it, stay in suite room for full splendor. Dev Niwas is among the top choices in the old city, just off the main road. This regal 17th century mansion has three floors, a fountain, courtyard and rooftop restaurant. Rates start from 1,500 rupees per night for a double. Hotel Bundi Haveli is also popular in the old city near the lake, with 12 guest rooms that have been recently restored in a contemporary style. Haveli Braj Bhushanjee sits just below the fort and provides a closeup view of it from its rooftop terrace. The hotel's miniature paintings and antiques are major attractions. Rates start from 3,500 rupees per night for a double. If you want outstanding palace views at a lower price, try 250 year-old Bundi Inn or Kasera Paradise nearby. For ultimate proximity to the palace, stay at 300 year-old Bundi Vilas. It's built into the crumbling palace walls! There are seven guest rooms but the property only discloses its rates upon request. However, you can expect to pay about 6,000 rupees per night for a double room. In addition to step wells, Bundi's rulers made several lakes to meet the town's water needs. Nawal Sagar dominates the old city and has a semi-submerged temple dedicated to Lord Varuna, who is worshiped as the god of water. It's lovely to take an evening sunset walk around the lake. The palace and fort are evocatively reflected in it, creating a brilliant photo opportunity. They're also illuminated after dark, adding to the setting's appeal. The much larger Jait Sagar, about a 15 minute walk north of town, is worth visiting as well. This scenic lake is surrounded by small temples and the Aravalli hills. It looks most spectacular when it's enlivened with blooming lotus flowers from April to October. Another highlight is the small 18th century Sukh Niwas Mahal (Palace of Bliss) on the lake's edge, where Rudyard Kipling is believed to have written part of "Kim." Sadly, its grandeur has gone after centuries of neglect. Holders of composite tickets can access the Sukh Mahal along with Raniji ki Baori and the 84 Pillared Cenotaph. The cost is 350 rupees for foreigners and 75 rupees for Indians. On the other side of Jait Sagar, opposite Sukh Niwas Mahal, the memorial cenotaphs of Bundi's royal family stand amid an unkempt garden known as Keshar Bagh (or Kshar Bagh). They were constructed during the 16th to 19th centuries, and some have wonderfully intricate carvings on them. The details of all the rulers — and their many wives — are documented on the cenotaphs. If the gate is locked, ask around to find the caretaker or someone who has the key. To the south of town, there's another 17th century cenotaph (Chaurasi Khambon ki Chhatri) that the king built to honor his foster brother. It's an imposing two-story structure with 84 pillars. Of most interest are the paintings on the walls and ceiling. Masala chai is ubiquitous in India but many people will agree that Krishna makes the best tea in Bundi. He's been serving it up, with his signature blend of spices (ginger, cardamom, cinnamon, and black pepper), to satisfied customers at his tiny tea shop since 1999. The tea is a huge hit with foreigners who flock to the legendary shop. They've even decorated its walls with groovy graffiti art. The shop is not hard to locate. It's situated on Sadar Bazaar road, not far from Charbhuja temple in the old city. As its slogan says, "Add some masala in your life with Krishna." Interested in handicrafts, particularly pottery? There are a couple of villages north of Bundi — Akoda and Thikarda — that produce ceramic water pots and can be visited on a day trip. Akoda is the larger and better known one, although both welcome guests. The villagers will eagerly show you the fascinating pottery making process, and for a fee, give you a detailed lesson. It's also intriguing to see their traditional-style homes, with dung flooring, and learn about their lifestyles. Ideally, take a professional guide from Bundi with you so that communication isn't a problem. Both villages can be reached by auto rickshaw. Bundi is one of the top monsoon travel destinations in India, partly because of its special Teej festival celebrations in August (the town is also really quiet and refreshing during that time of year). The Teej festival is linked to the holy union of Lord Shiva and Goddess Parvati. This makes it an important occasion for women, who invoke the goddess's blessing for a happy marriage. However, the focal point of the festival in Bundi is a peppy street procession with dressed up camels, elephants, musicians, dancers, folk artists, and the goddess on a palanquin. It winds its way through the old city, from Nawal Sagar to Azad Park. A lively local fair draws a crowd as well. Celebrations continue until Janmashtami, when Lord Krishna was born. A similar street procession is also a feature of the Bundi Ustav, an annual cultural festival that takes place for three days in November just after the Kartik Purnima full moon. The festival is held to promote tourism in the region. Its eclectic events include traditional sports such kabaddi, horse and camel racing, an arts and crafts fair, folk music and dance performances. Of course, the festival would be incomplete without turban tying and mustache competitions too.